All you boys and girls need to bookmark Valentines Day now, sleeping on the couch because you forgot is no way to start the year, although thankfully Image Comics comes to the party with a few decent sofa-based reads to help pass the time if you do. Of all the cover images Image's got going in February, these are the four that grab my attention most. ONE TO WATCH: WHO IS JAKE ELLIS? #2 Tonci Zonjic. I really dig what Tonci's trying to do here. It's great seeing folks play around with layout, and the monochrome feel really holds it all together. 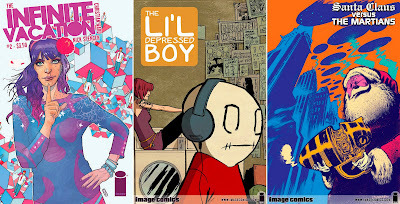 ARTIST AND TITLE: Christian Ward - The Infinite Vacation #2, Sina Grace - The The Lil' Depressed Boy, and James Harren and Dylan McCrae - Santa Claus vs The Martians #2 (of 4). More Image Comics goodness after the jump. I love your comment 'sofa read'. Each of these titles looks a little relaxed and a bit laid back. Which will be perfect for us in NZ is the height of summer! They have a very retro feel about them. 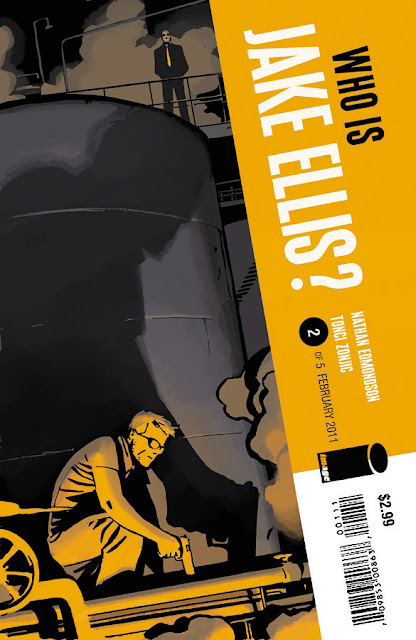 Love the typography and design on the Ellis book--the kind of thing that would catch my eye if I saw it on the racks. Yeah Jonny Image have some pretty classic pulp books going at the moment. I haven't picked up an image title since I had to drop Invincible, but they are always in the corner of my eye. Yeah I am a sucker for Typography to Rob! It's my favourite form of design.